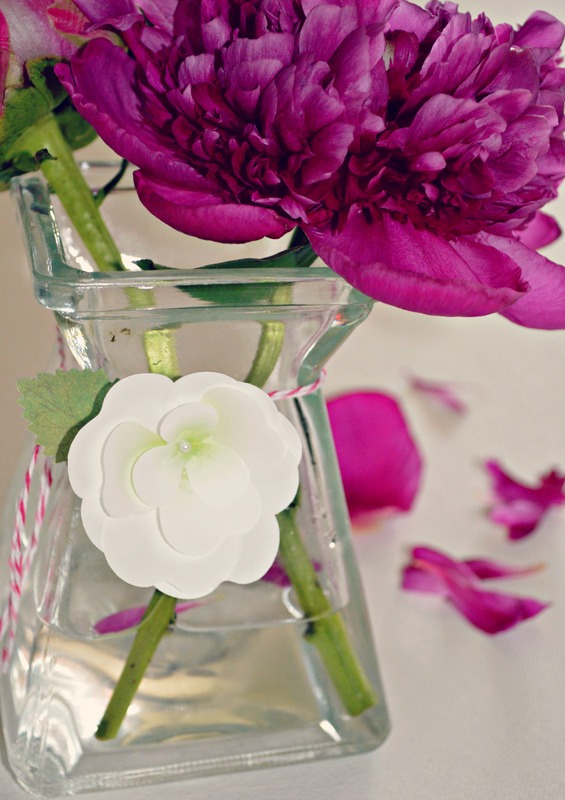 These sweet Martha Stewart flower stickers (maybe the grown-up word is “embellishments”?) were marked down to $1.99 at Michael’s. Clearly I could not pass up something this lovely! 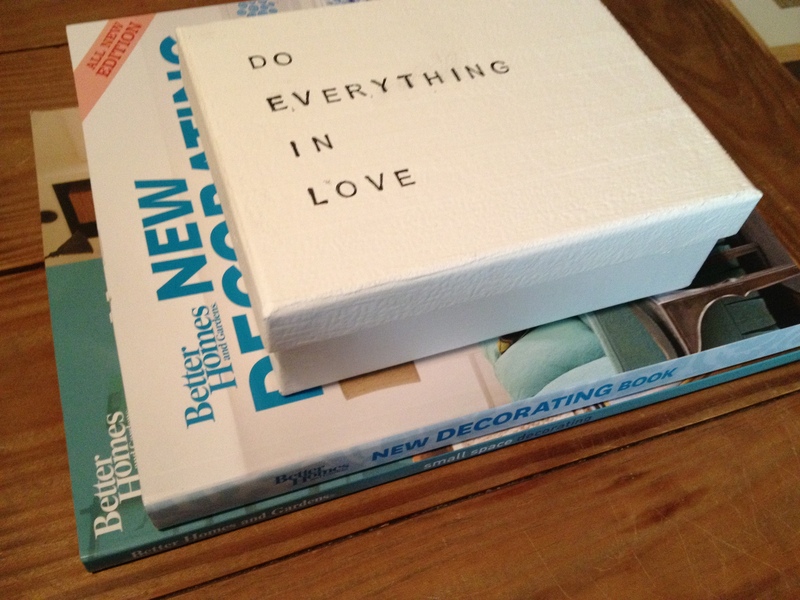 I decided to use them to add some charm to a few everyday objects around the house. 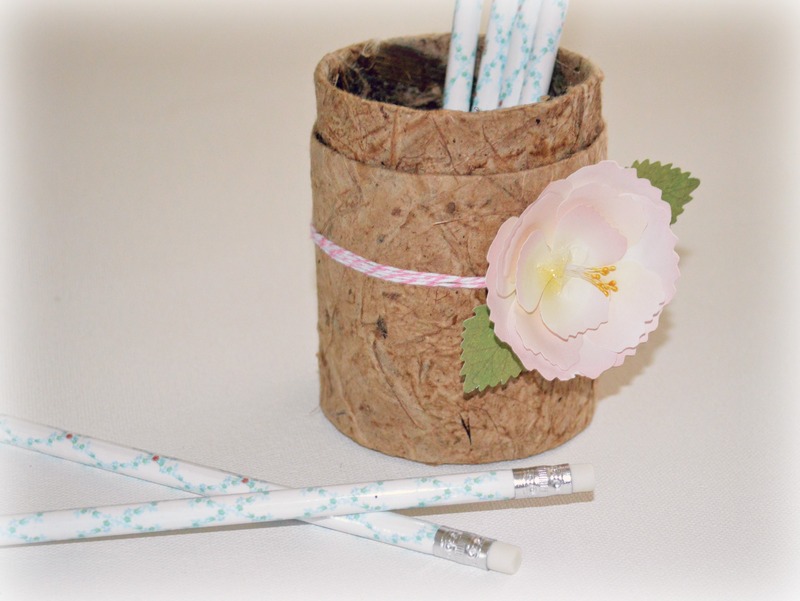 This plain, cork pencil cup got a makeover with some pink baker’s twine & a sticker. I wish I could remember where I got those pencils – I would guess Michael’s but I’m not sure. I love them. I got the flowers at my local grocery store. I plan to steal loads of peonies from my mother’s garden when I visit home this weekend, so watch out, Mom! I love these stickers. I want about seven hundred more to stick to every boring object in my house. Have you found anything amazingly lovely for a bargain at your local craft store lately? 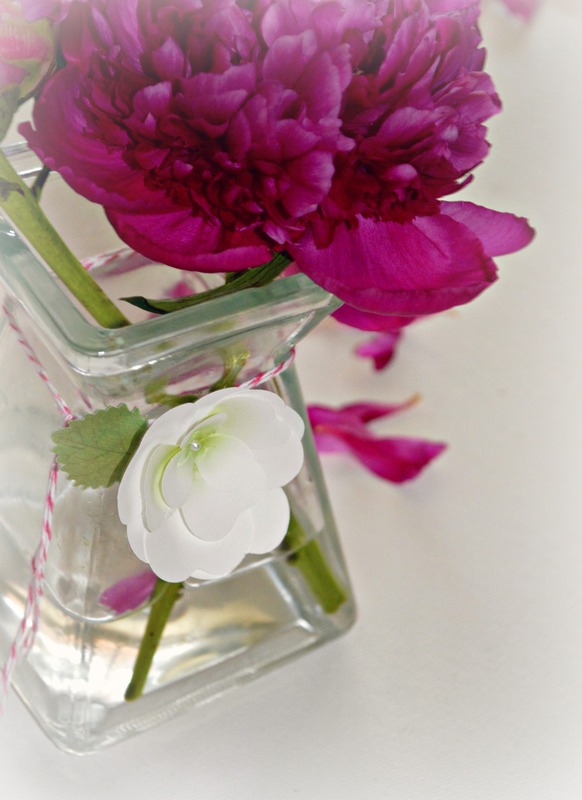 Are you digging the peonies, or do you have a different favorite flower of the season? Hey everybody! I hope you’re all enjoying your Memorial Day Weekend – I cannot tell you how amazing it is to have a few days *truly* off – I’ve made a pact with myself to put off work for a few days and focus on things that make me happy – like spending quality time with my husband, crafting & decorating in the home, and catching up with my DVR. So last night, while watching episodes of Veep (I love Julia Louis-Dreyfus! 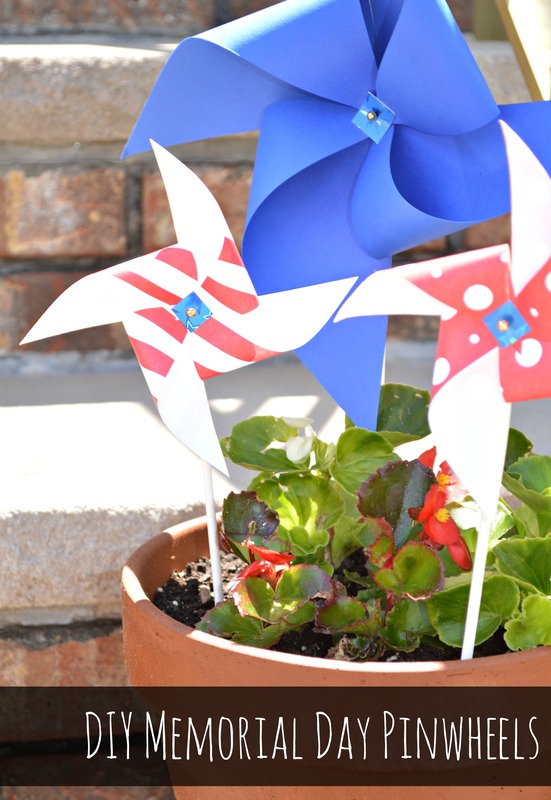 ), I made these fun & patriotic pinwheels to decorate our flower pots for Memorial Day! There is something so charming about pinwheels – they are simple and sweet, and they remind me of childhood summer days, barbeques & bare feet. 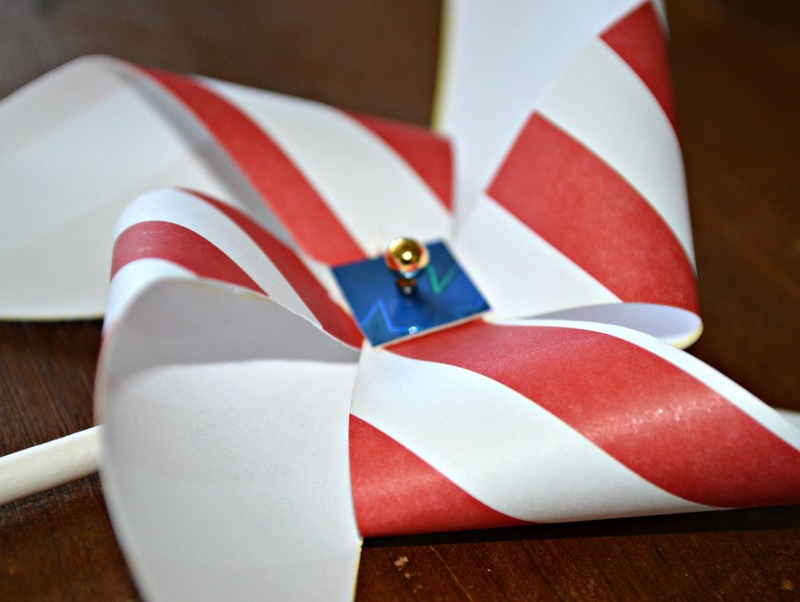 Pinwheels are very easy to make, and I’ve seen them featured in weddings, showers & summer soirees for a lovely DIY touch! 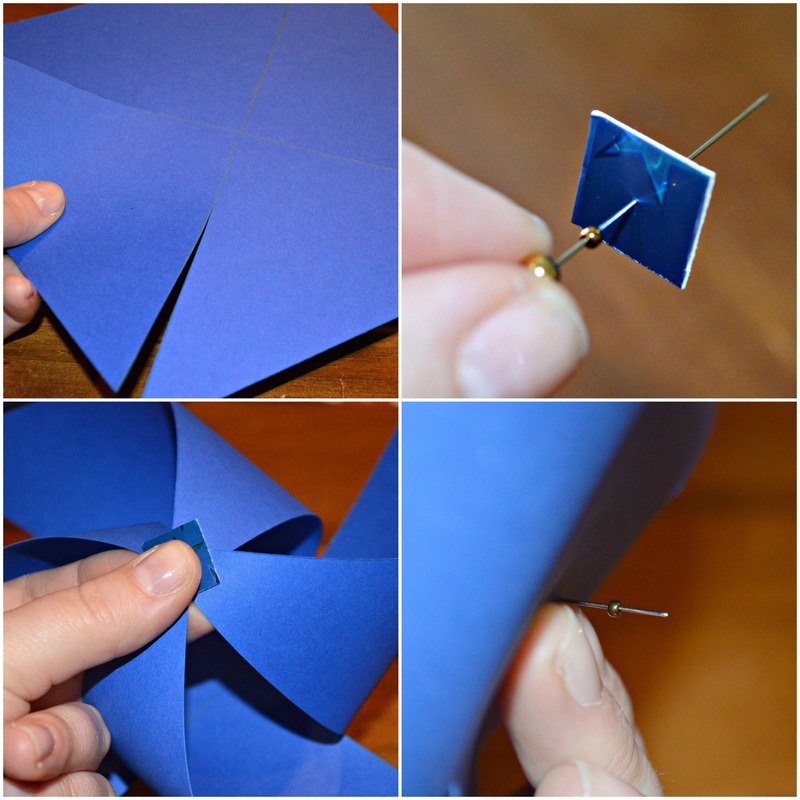 Paper – you can use construction paper, scrapbook paper, or other craft paper. Double-sided paper would be best, but I used what I already had in my craft supplies. 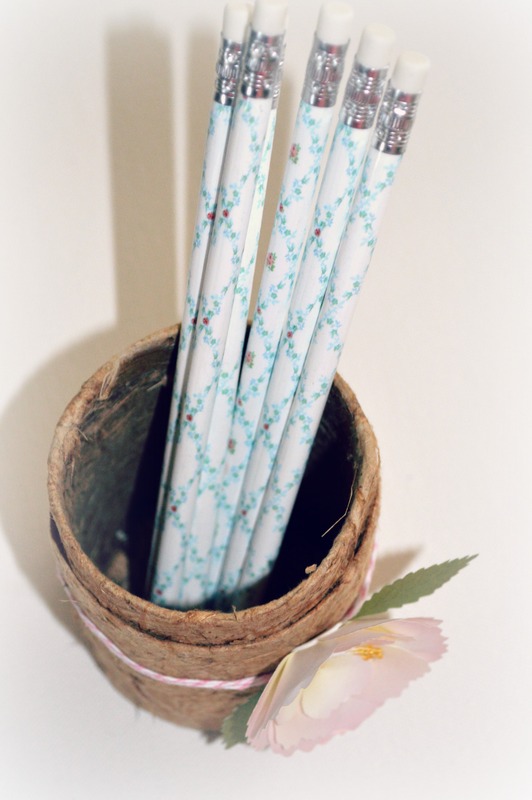 Dowels/Sticks of some kind – you can use wooden dowels, popsicle sticks, chopsticks, pencils – whatever your heart desires! 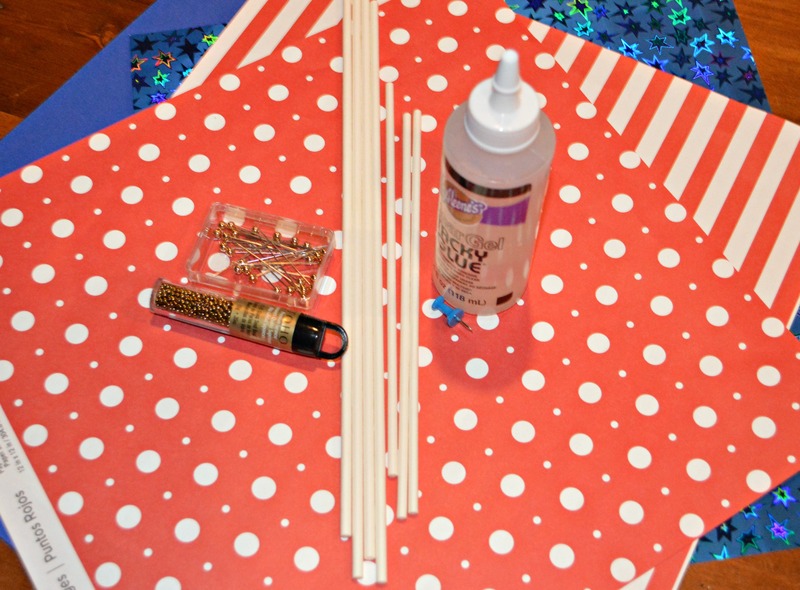 I used lollipop sticks – which can be found in the baking section of Michaels/craft stores. Again, I was working with what I had! Decorative Pins – you can use wire cutters to cut the sharp point off your pins for safety! Small Beads – the beads are the secret to making a spinning pinwheel! 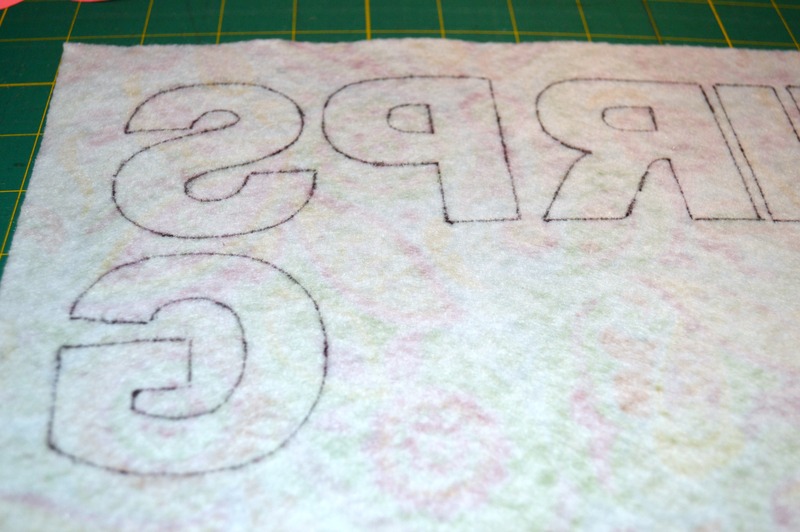 2) Cut your paper into a square. I made pinwheels that were 8×8 and 4×4. 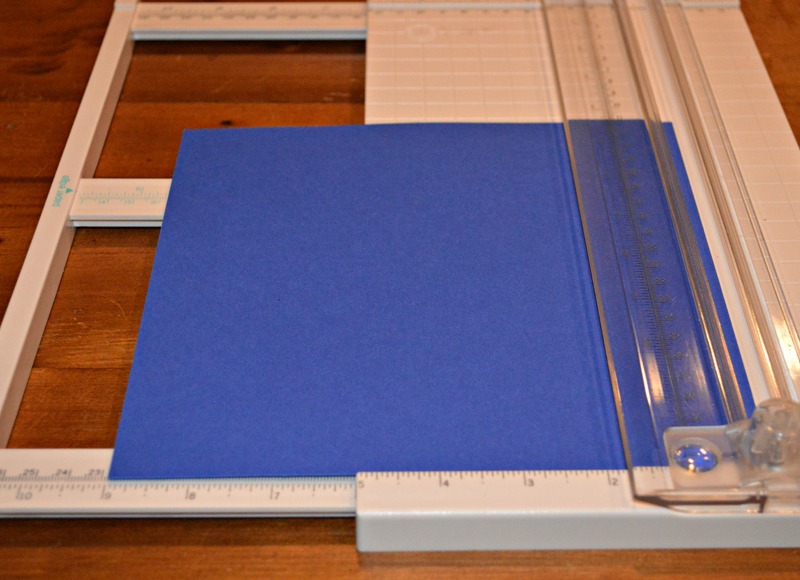 3) Using your ruler, draw lines diagonally across your paper from corner to corner. Use your lines as a guide and cut from each corner in towards the center, stopping about 1/2 to 1 inch before the center. Use your thumbtack to pre-poke holes in every other corner of your four triangles. 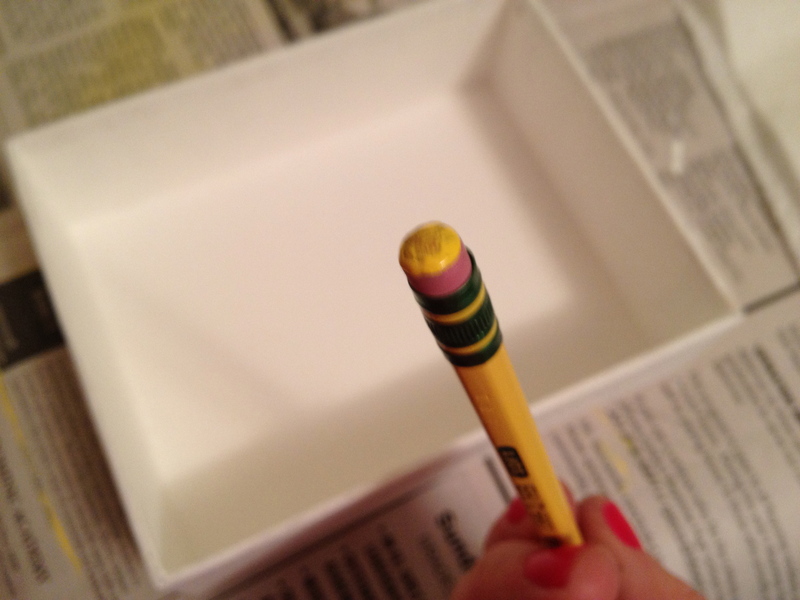 4) Place one teeny bead onto your pin, followed by a small square of paper (decorative/contrasting color). 5) Carefully bring each pre-holed corner in towards the center onto the pin, moving clockwise until four corners are through the pin. Push the pin through the center of the paper (where your two lines mark an X). 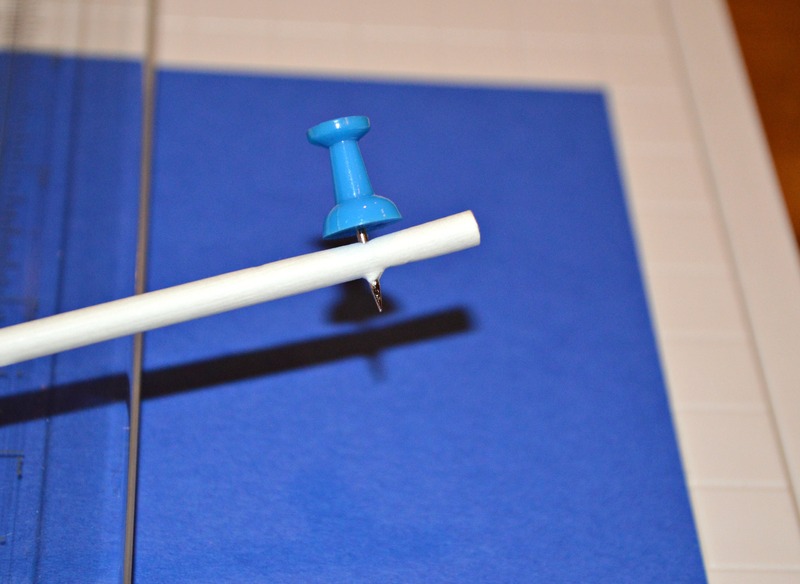 6) Place another bead on the other side of the paper, and then thread your pin through the hole in your dowel. 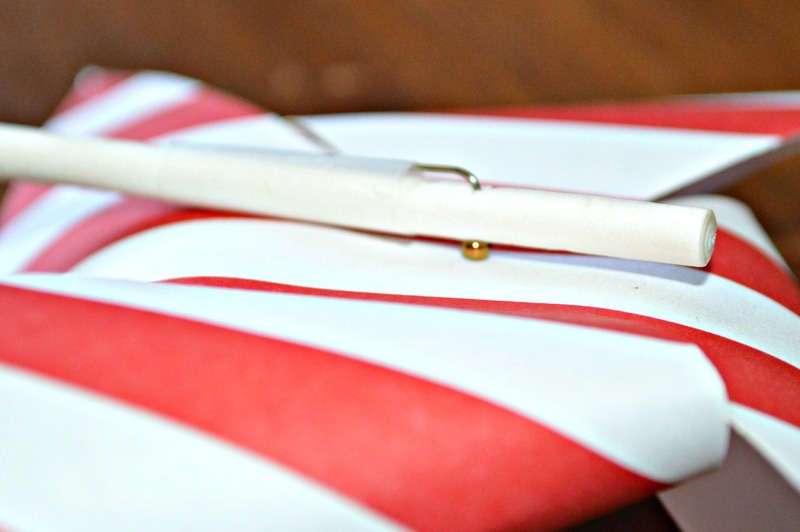 7) Use a pair of pliers to bend the pin down at a 90 degree angle, and use clear tape to secure it to the dowel. Your end result will be a lovely spinning pinwheel! 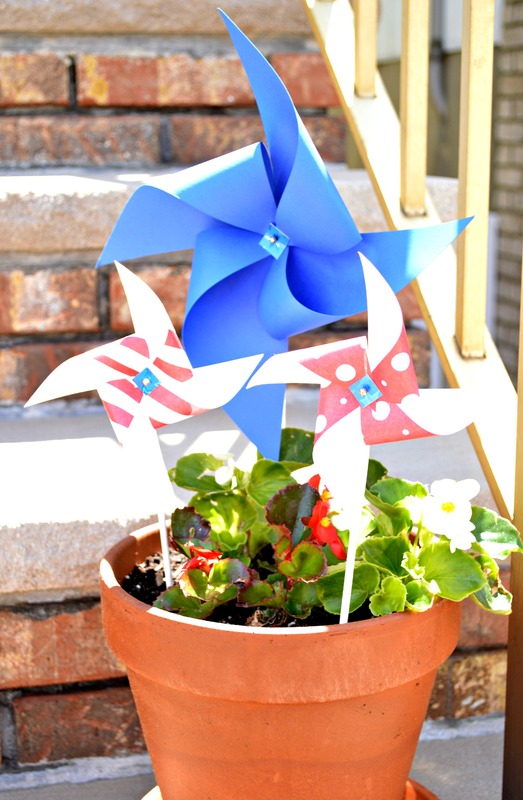 I do not have much in the way of red, white & blue decor out for Memorial Day, but now I have these lovely, spinning little pinwheels to decorate the flower pots on our front stairs. 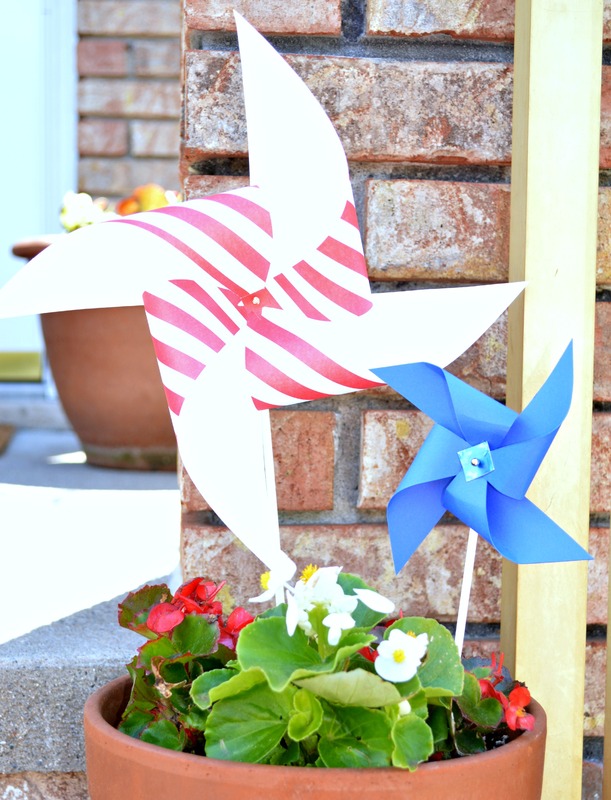 It is exceptionally windy today, so after taking pictures of my creations, I had to bring the pinwheels in so that they didn’t spin away. I’m hoping tomorrow will be a bit more forgiving, so I can deck the staircase out for Memorial Day! What are you up to this weekend? I hope you’re enjoying whatever it is you’re doing! Yippie! It’s the first day of Spring! It’s still freezing outside – but as the birds outside my window and the bulbs in my mother’s garden are concerned, Spring has arrived – and I couldn’t be happier. Spring is my favorite month (mostly because it brings all things that I love – daisies, bicycle riding weather, 3/4 sleeve cardigans and my birthday). 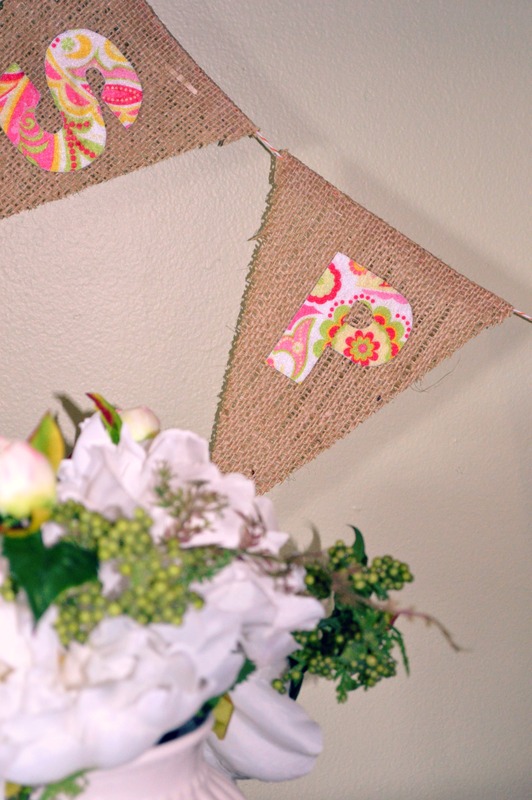 I thought I’d welcome Spring into our home with a little DIY burlap & felt bunting. I followed pretty much the same steps used to make the Love Bunting for our wedding, except instead of stenciling, I attached letters cut from a fun & colorful felt pattern. 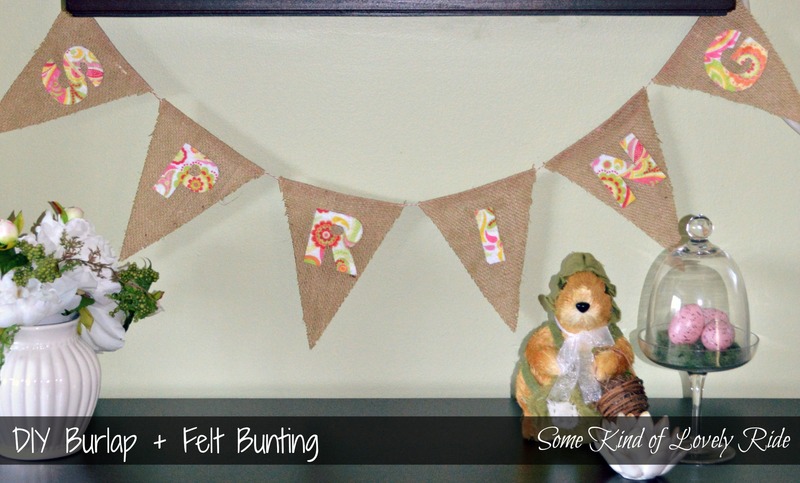 To make my bunting, I used burlap, felt, orange & white bakers twine, mod podge glue, and my fabric cutting board & rolling cutter. 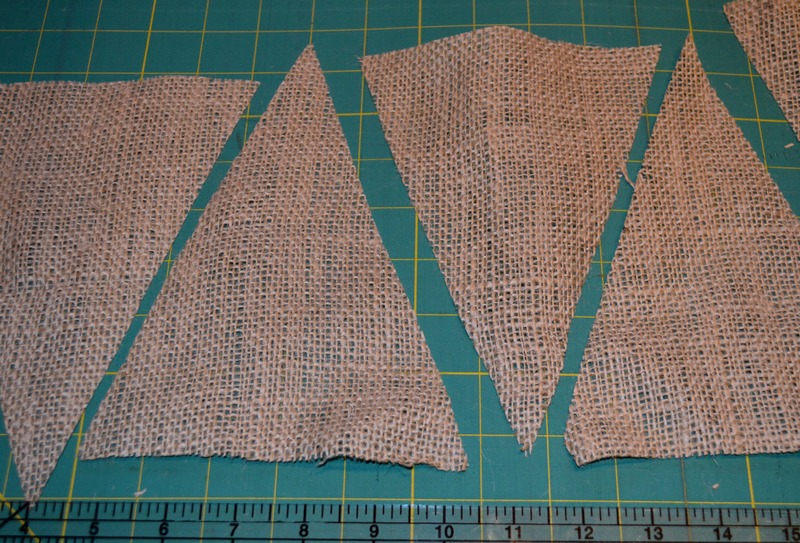 I measured and cut each triangle out of burlap, and gave each piece a coating of Mod Podge to keep the edges from fraying. I printed the letters onto cardstock, cut them out and then traced them (flipped!) onto the back of my felt so that no lines would show. 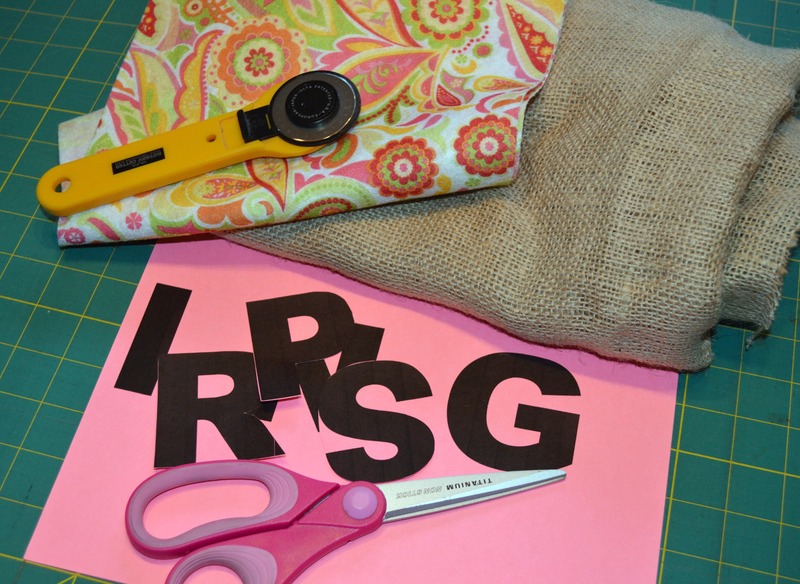 I used glue to attach the felt letters to the burlap. And more glue to attach the baker’s twine (folding over the top edge of the burlap for a secure hold). 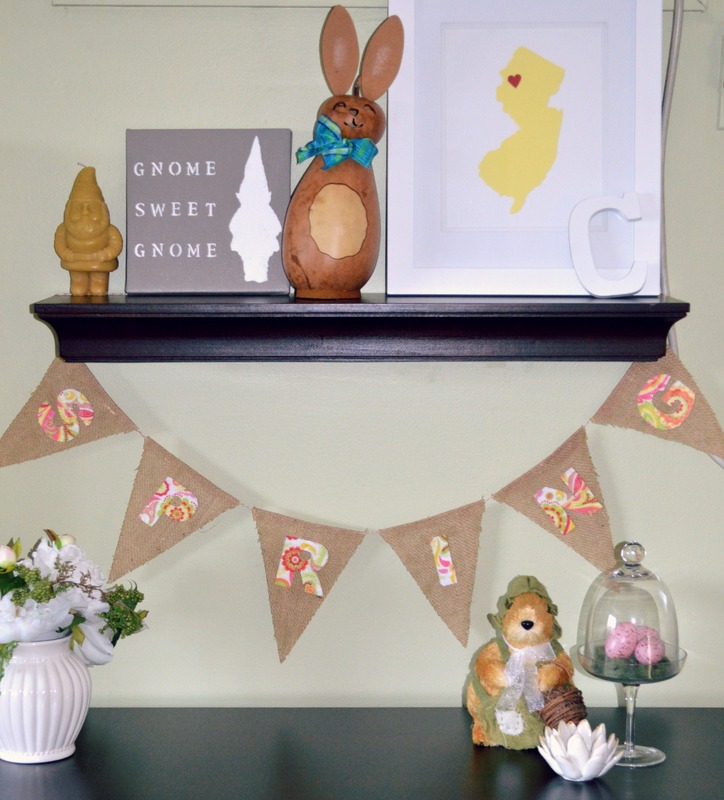 My salute to my favorite season now hangs in my little craft storage/display area – accompanied by some seasonal bunnies & a little egg display. (Along with my Jersey State Love Art & Gnome Sweet Gnome Canvas). 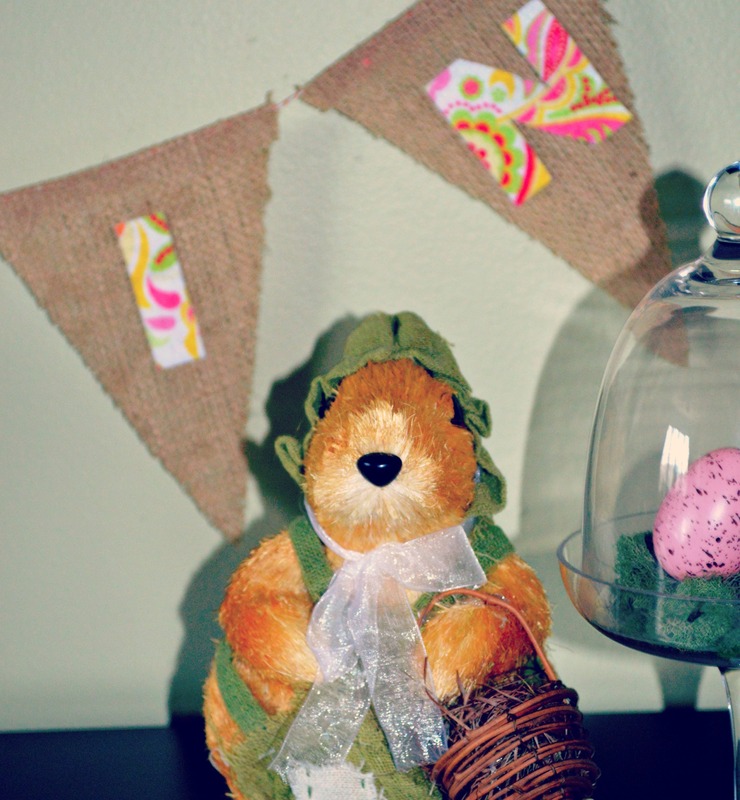 Both bunnies came from The Farmhouse Store – which I shared my love for yesterday! 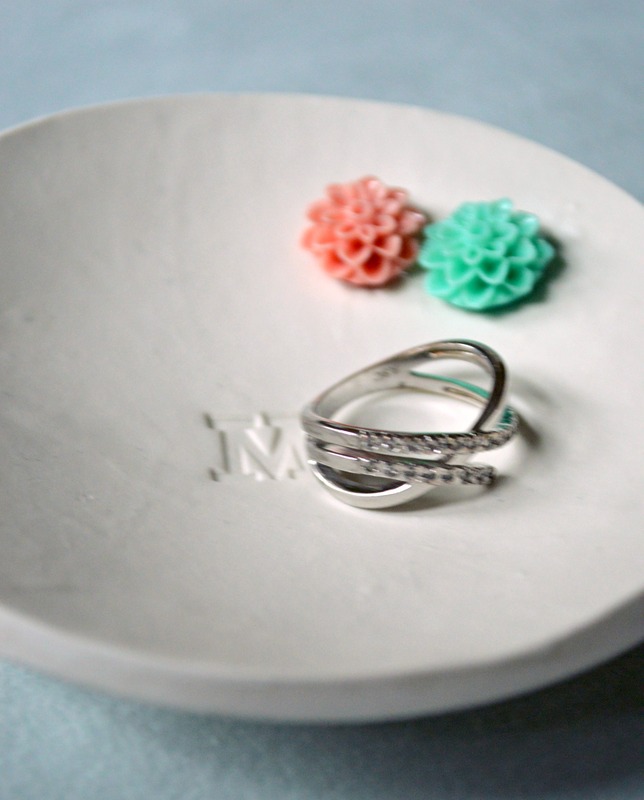 Yesterday I announced a little giveaway that I’m hosting- so don’t forget to enter for the chance to win your own personalized ring dish handmade with love & shipped right to your door by MOI! 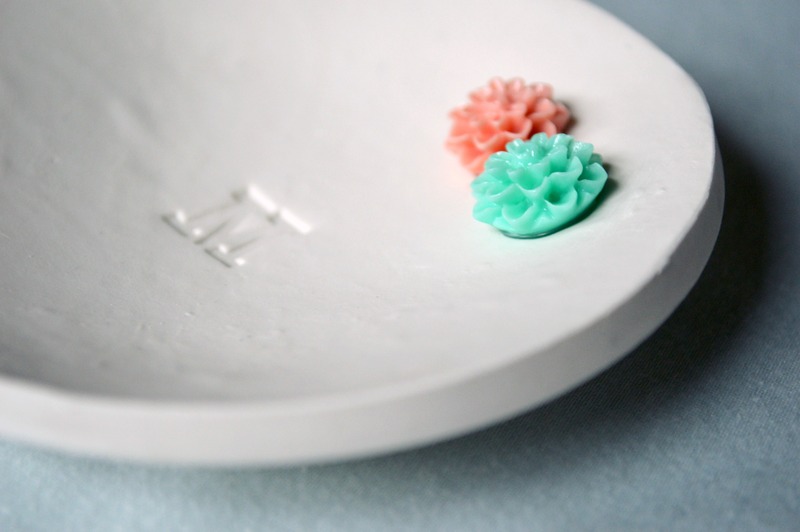 I love these little dishes so much, I’m giving away TWO! 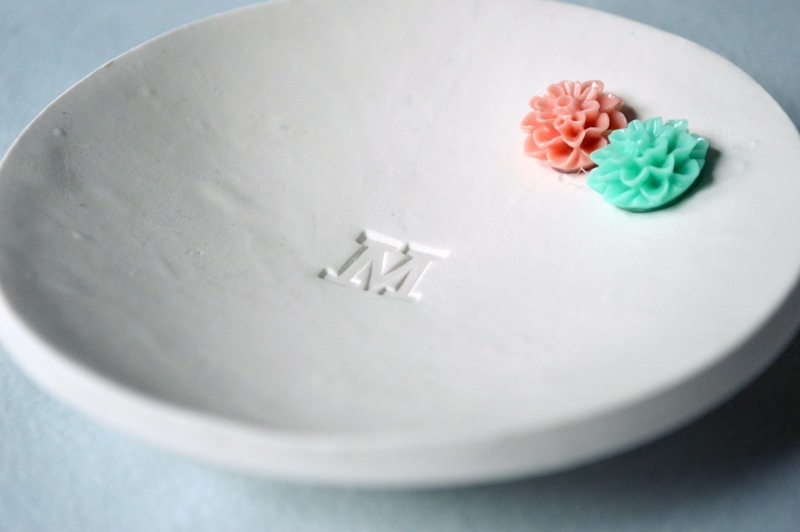 This bowl was designed especially for my bestie-and-former-bridesmaid Meg, hence the “M” initial! I had so much fun making hers, that I made myself a matching one! 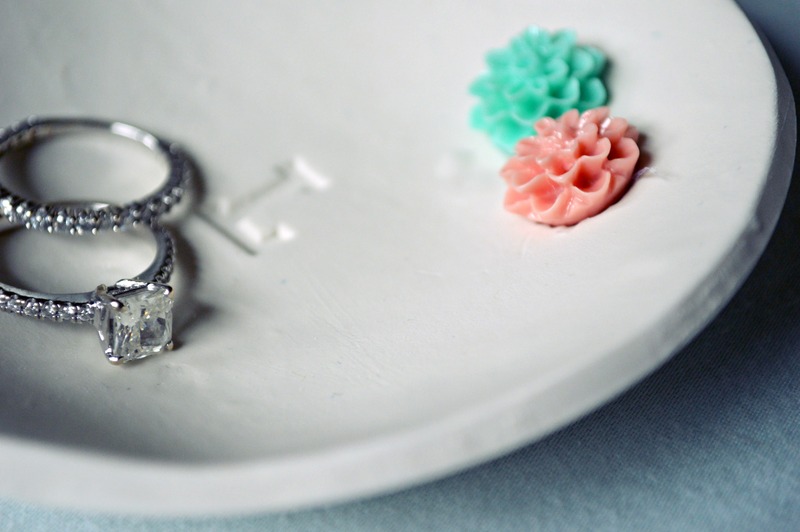 I’ve seen these little dishes used at weddings for the ring bearer – how great would that be? 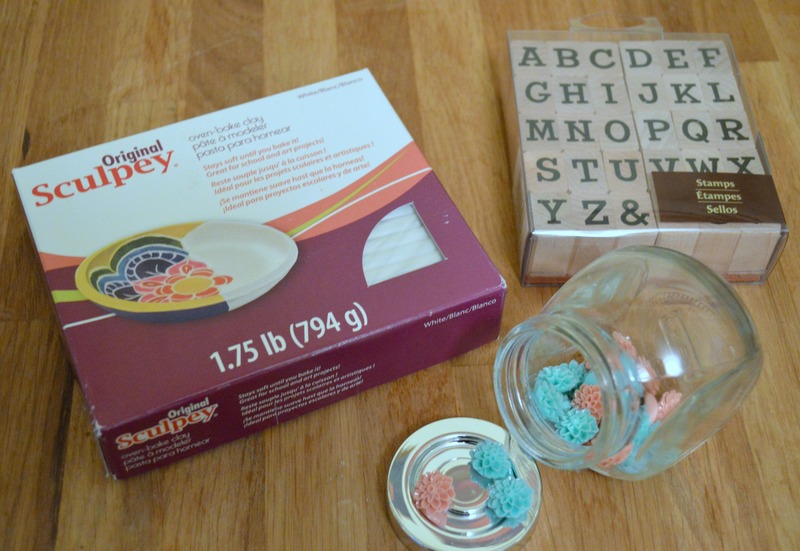 -White Oven Bake Clay – I used Sculptey (found in craft stores & on Amazon). -Bowl/cup/lid of some sort to cut out the dish to size (I actually used a metal candle holder- go figure). -Sweet & Teeny Decorations – I used these precious Resin Cobochans in Beach Glass Green and Spiced Cider Salmon from Baubles of Fun on Etsy. Take a hunk of clay (I would estimate I started with about 1/4 from the box) and mold it into a ball. 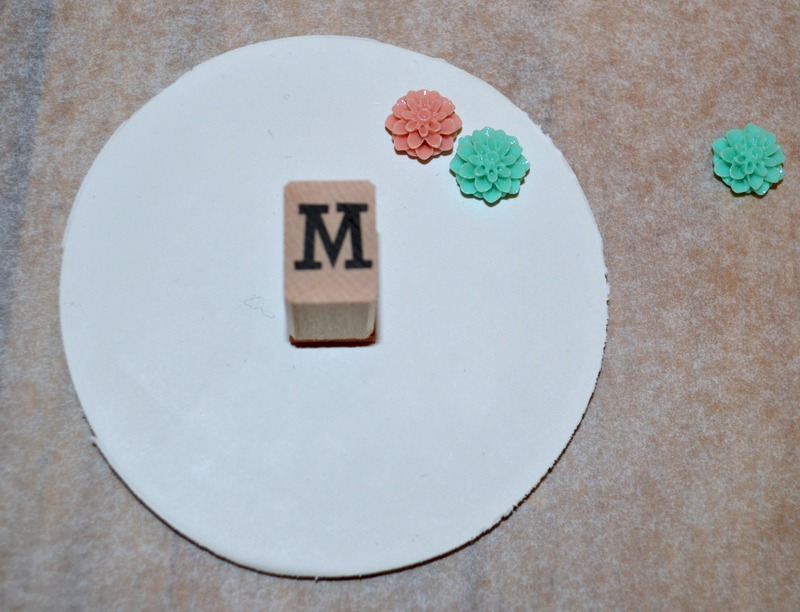 Set the clay ball on parchment paper & use a rolling pin to flatten the clay to about a 1/4 inch thickness. 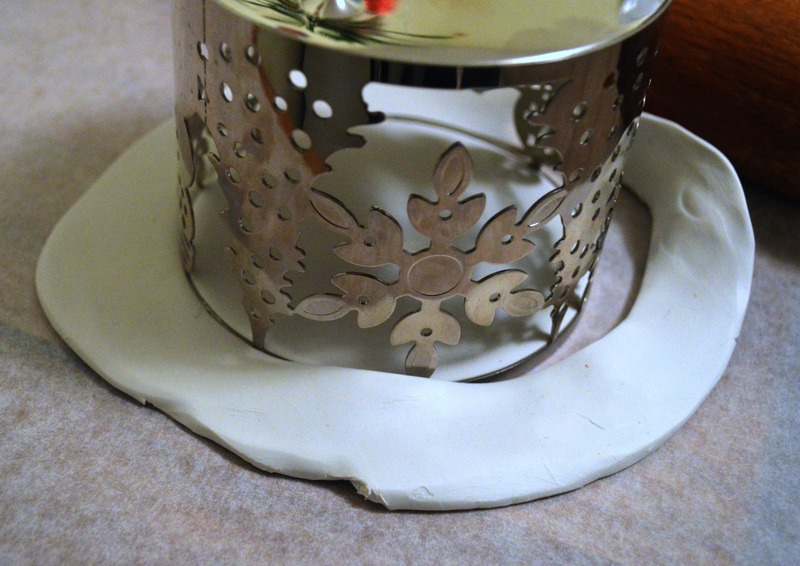 Using a bowl, cup, lid, or whatever – my “whatever” is a candle holder with a nice thin rim in just the size I wanted – cut out a circle & remove the extra clay. 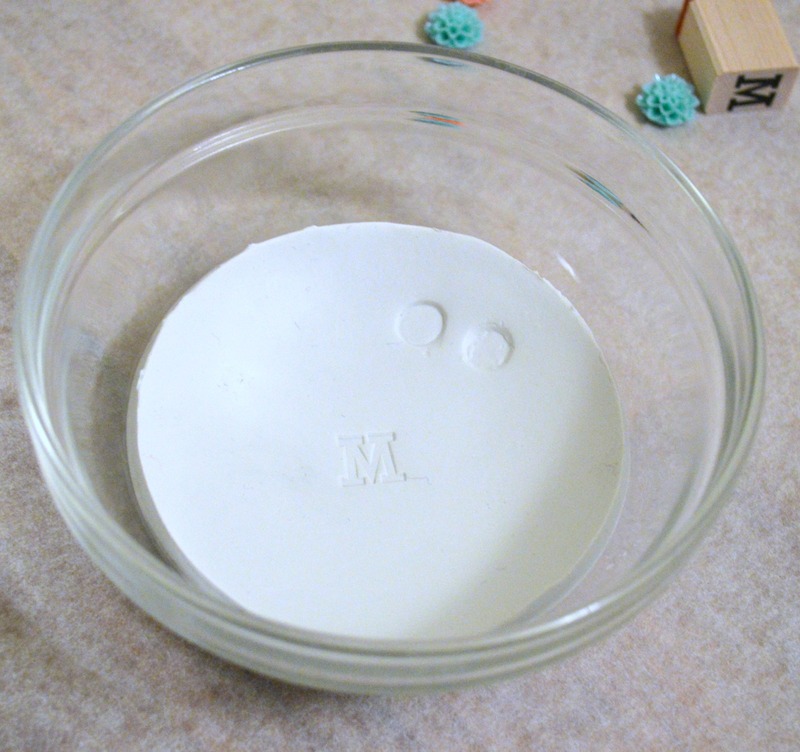 Carefully press the clay into an oven safe bowl (mine is a glass pyrex bowl with the right depth & shape to form a slightly rounded dish). Place the bowl onto a cookie sheet, and bake in the oven at 275 degrees for about 30 minutes. When you remove the bowl from the oven, let it sit for about 15-20 minutes or so to cool. Then carefully turn the bowl over & the dish will pop right out! After the dish has completely cooled, you may need to use some fine grain sand paper to smooth the edges. Then it’s time to glue on your decorations. 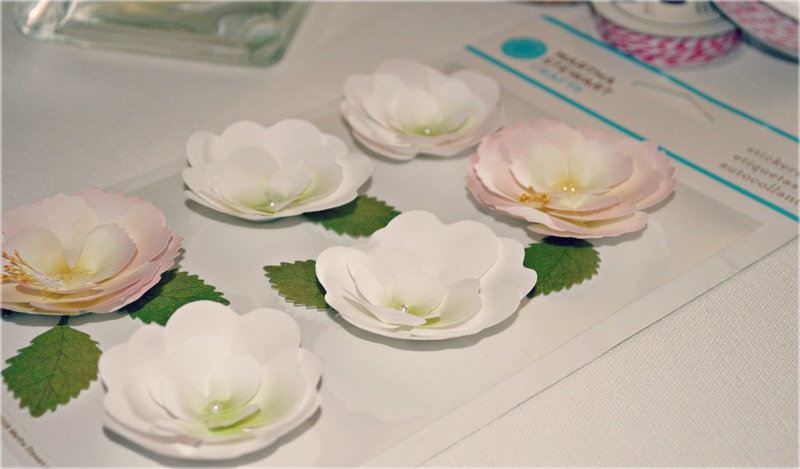 The resin flowers fit perfectly into the pre-made indentations. I used a hot glue gun to attach them – and that was that! I love the simplicity of the white clay – but you could definitely paint or glaze these and get some beautiful results! You’ll have leftover clay, so after you make one for yourself you can make gifts for all the ring-wearin’ gals in your life. 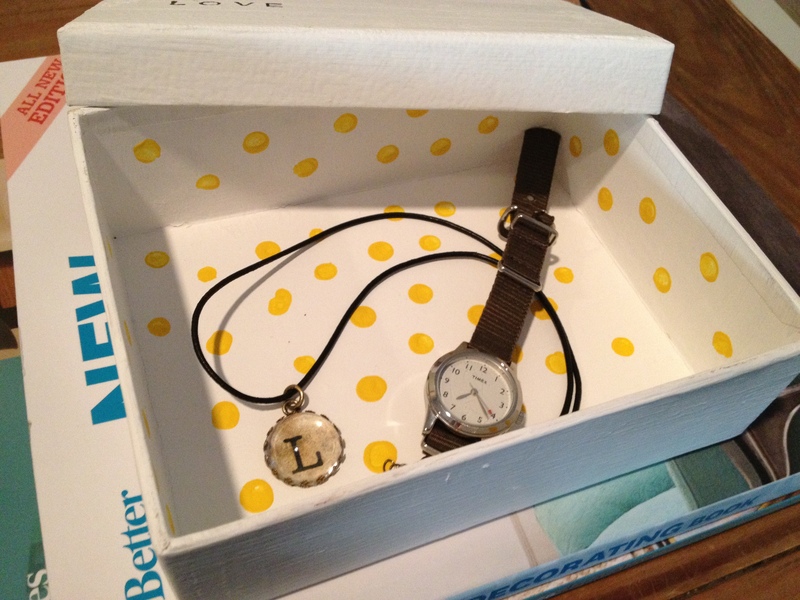 They would make great bridesmaids gifts, or congratulatory gifts for the bride at engagement parties. 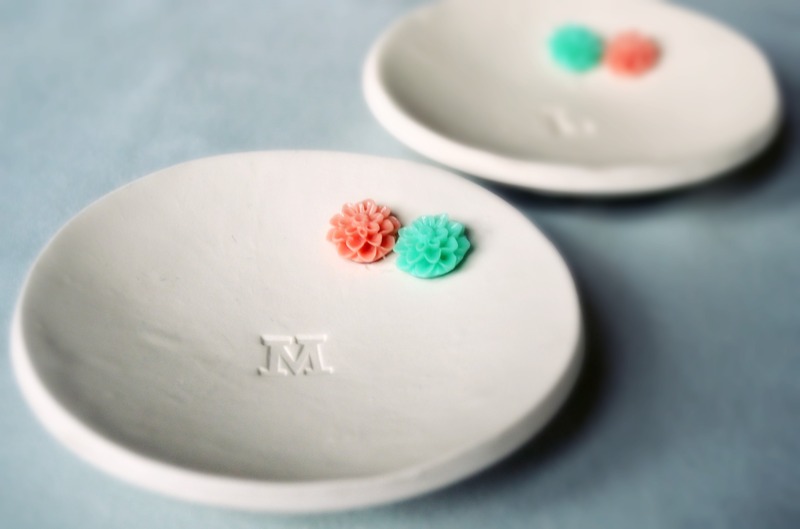 I’m also thinking about making one to use as a soap dish in our bathroom! 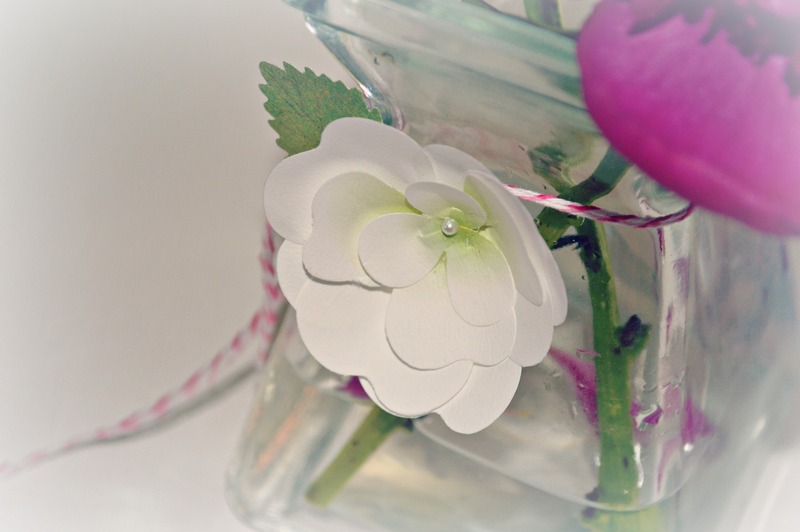 And seriously, the pretty coloring & total cuteness of these little resin flowers totally makes the look – so head on over to Baubles of Fun to see Ronda’s jewelry & decorative accessories! And don’t forget to enter the giveaway to win one of these for yourself! 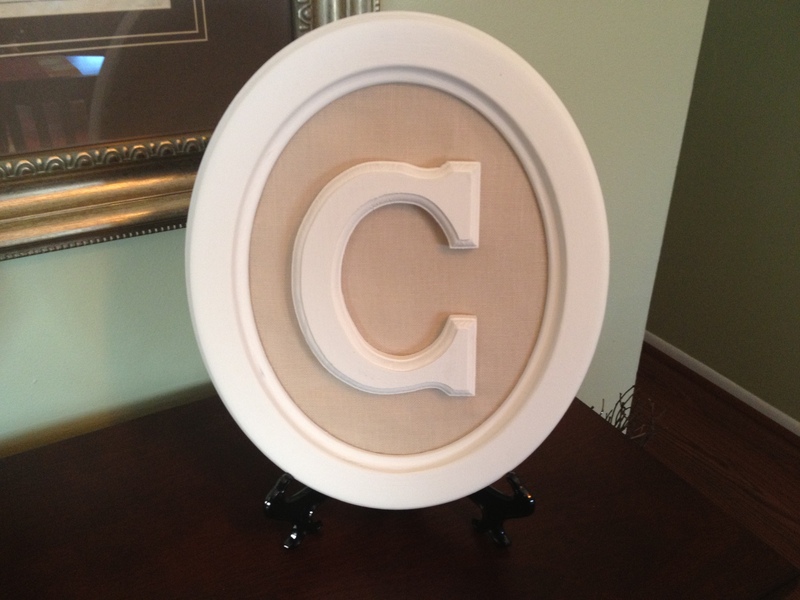 It will have the initial (or initials) of your choice, and be shipped with special love & care right to your door! Will you be doing some Cyber Monday Shopping today? If you’re still searching for the perfect & unique gift for someone special in your life, I’m here to help you out! 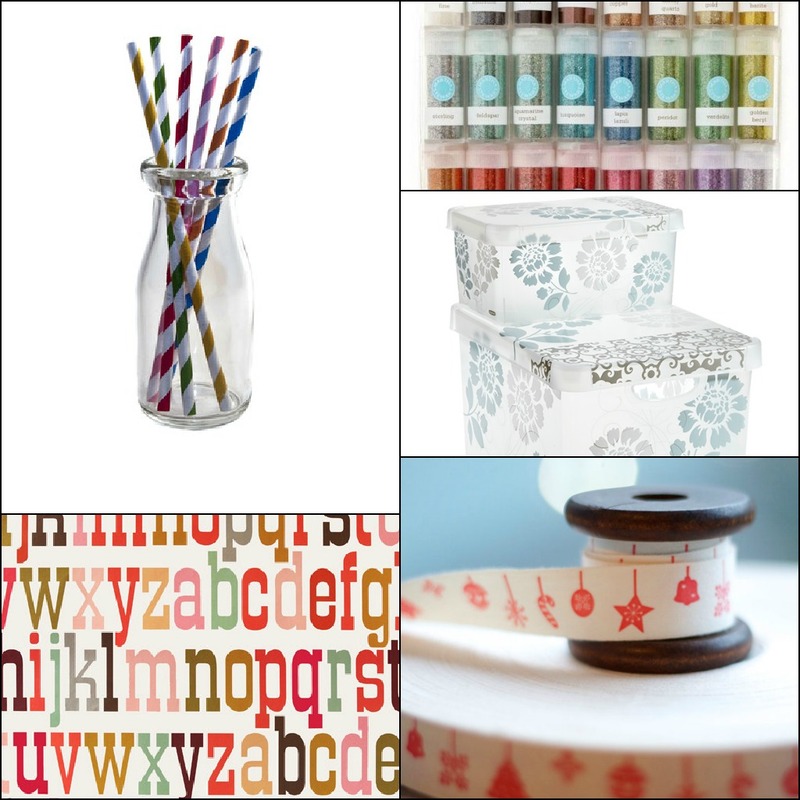 Clockwise from top left: 1) Multi-Colored Stripey Straws– $6 for a pack of 24- from Acme Party Box Company; 2) Martha Stewart Glitter Multipack – $18.99 for 24 colors – from Amazon; Garden Bloom Decoboxes – $8.99/$14.99 – from The Container Store; Vintage Christmas Cotton Ribbon – $5 – from The Stationary Room on Etsy; Letters of the Alphabet Giftwrap – $3.15 (on sale!) – from Kate’s Paperie. 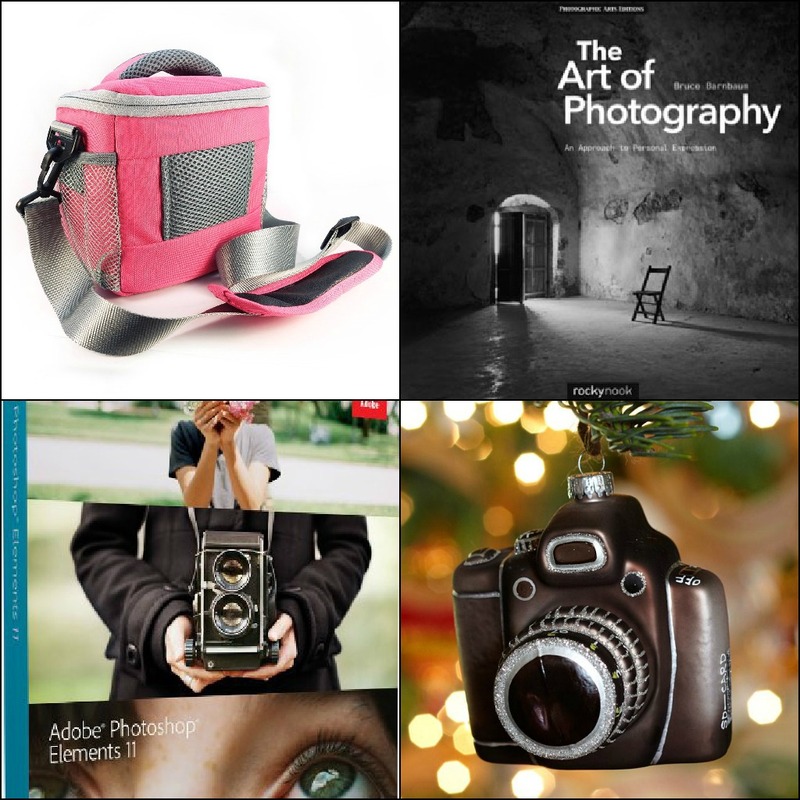 Clockwise from top left: Pink Camera Shoulder Bag – $18.99 – from Amazon; The Art of Photography: An Approach to Personal Expression – $23.71 – from Amazon; Vintage Camera Glass Ornament – $6.50 – from Pottery Barn; Adobe Photoshop Elements 11 – $49.99 – from Amazon. 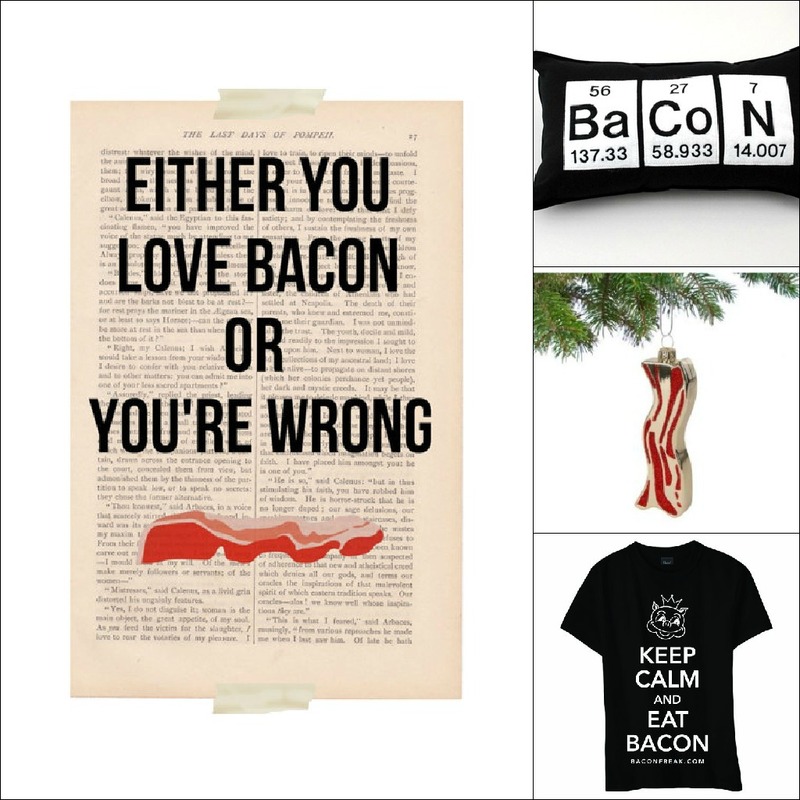 Clockwise from left: Bacon Print – $9.00- from Ex Libris Journals on Etsy; Bacon Periodic Table Pillow – $35.00 – from Yellow Bug Boutique on Etsy; Bacon Ornament – $6.48 – from The Royal Bacon Society; Keep Calm and Eat Bacon Women’s T-Shirt – $17.00 – from Bacon Freak. In the spirit of saving the environment & crafting for less, I took this little cardboard box (that originally held a set of note cards) and gave it a face lift. 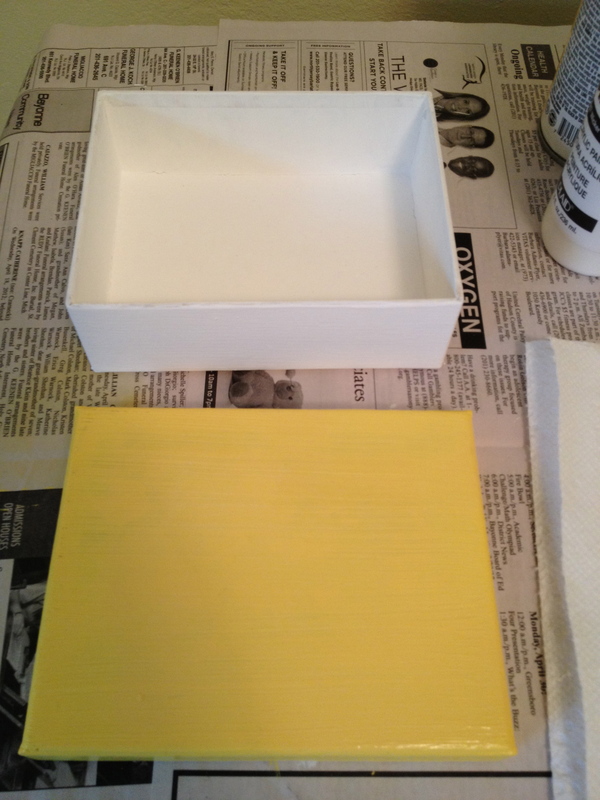 First, I coated the box in some white paint (Folk Art). 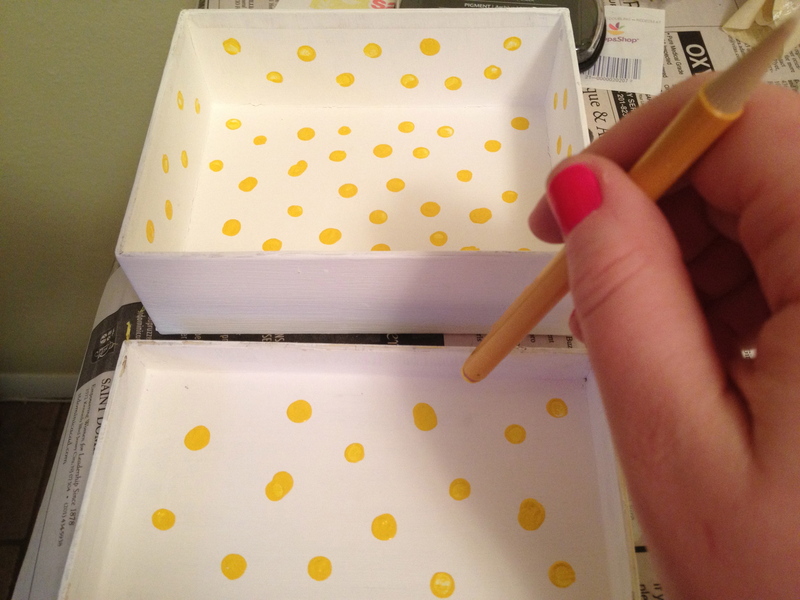 Then, using the eraser end of a good ol’ Number 2 pencil, I polka-dotted up the inside of the box (using Folk Art Medium Yellow). I know it is kind of silly looking, but I like it! 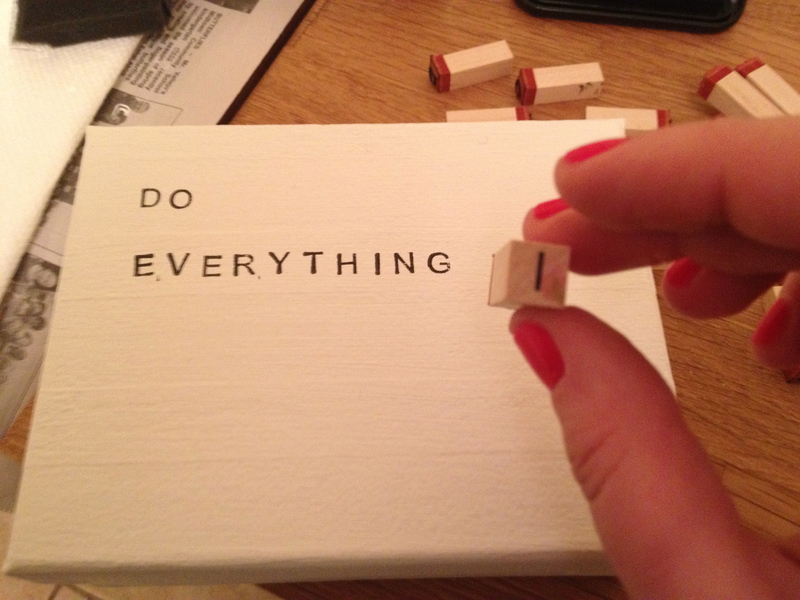 Next, I used my alphabet rubber stamps, and put a little message on the lid that speaks to me lately. 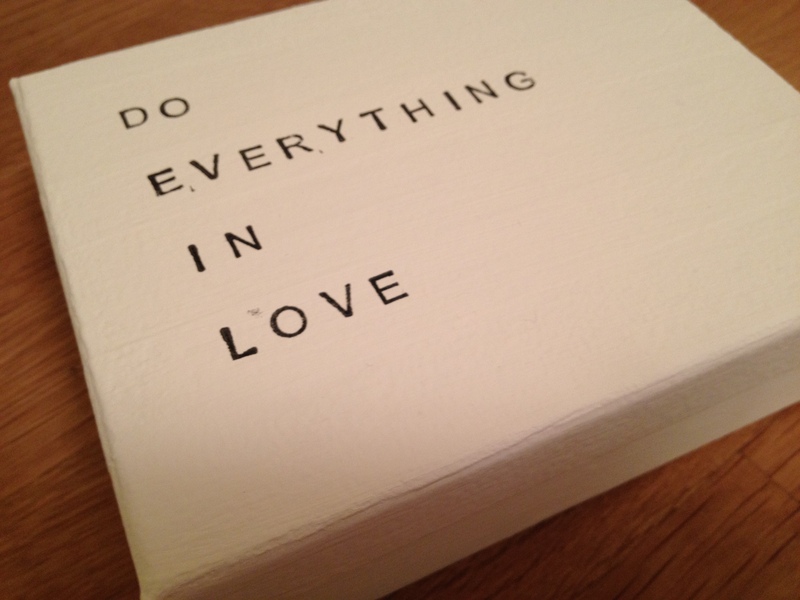 “Do everything in love” is my motto these days! 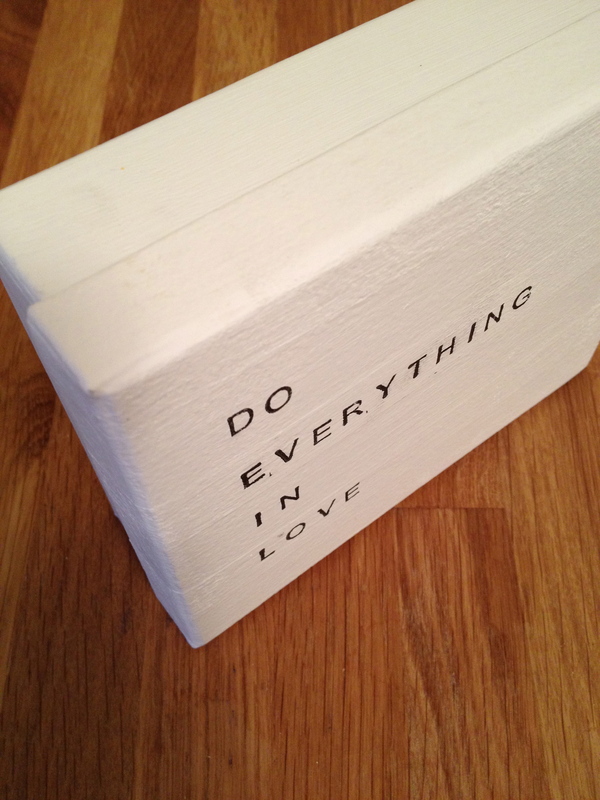 1) A daily reminder to put love into all that I do (I know, I am a cheese ball). This little project took a couple of days (mostly because I just worked on it/put on paint coats in the evenings), and cost me a big NADA! 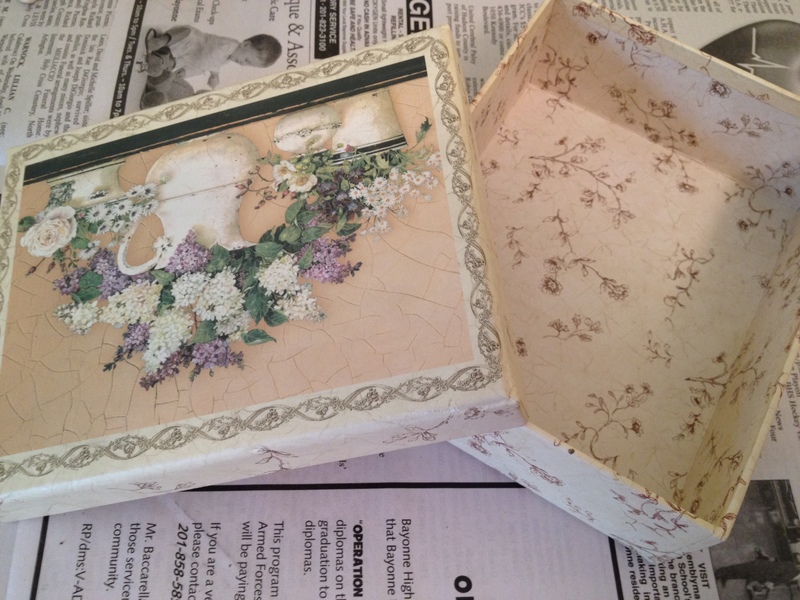 The box was an upcycle, and I already had the paint & rubber stamps. Win-win! What quick little projects have you been up to lately? This past Saturday morning rolled around with no obligations until 4PM. It was like Christmas in March. There is nothing that I love more than a relaxing weekend. I even had a semi-break from grad school homework, which usually hangs like black cloud over my weekends. We slept in (sort of- getting up at 8:45 doesn’t really qualify as “sleeping in”, but it is so much better than 6AM). 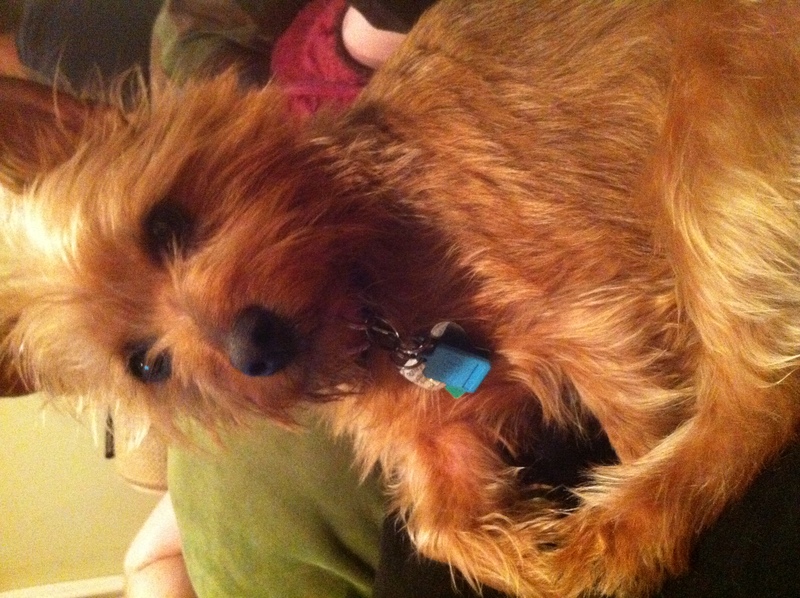 I could have slept longer, except our terror of an Australian Terrier was wide awake. And when Emma is awake, everyone is awake. She has a very unique way of waking us up when she wants to go to the yard. She stands right next to my sleeping head… and stares. She doesn’t bark, or climb on me. She just stands there and stares at my face. Trust me- that feeling of being watched is just uncomfortable enough to wake you from a deep Saturday morning slumber. Sure enough- I opened my eyes on Saturday morning to find Emma’s nose about 2 inches away from my face. Sometimes I wonder what she is thinking when she stands there staring like that. What are you plotting, Emma? A plan to trick me into leaving my closet door & laundry basket unattended? Or are you plotting to murder me for the insurance money? Good luck with that one, little dog… if you take out your parents you will quickly find out that new owners will likely be MUCH less generous with the treat jar. She looks innocent enough...but owner, beware. Either way- we were up. No worries- 8:45 on a Saturday morning with nothing to do until 4PM is lovely. We ordered breakfast from the diner, which we NEVER have time to do, and lounged around the house for a couple of hours watching DVR-ed episodes of The Daily Show & Colbert Report. Around noon, it hit. The crafting bug! I had time to spare, and now that our town has a Michael’s Craft store my crafting moods are easily abated. This time I went to Michael’s with a few projects in mind. #1- a wedding-related craft I knew I needed to practice to get perfect, so I wanted to start early. No internet deets until post-wedding! #2- spraying things with chalkboard paint. Is this a real project? No. More like an experiment that could lead to future projects. Either way- chalkboard paint comes as spray paint & is therefore locked up at Michael’s to prevent young hooligans from “huffing”. 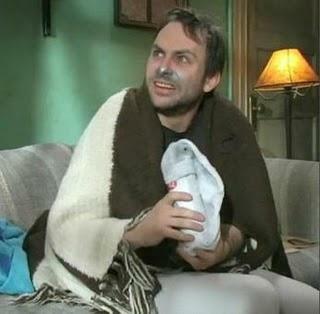 Always Sunny In Philadelphia fans, anyone? Anyway, I had a salesperson unlock the cabinet for me, but I was not allowed to carry the spray paint with me in my basket. It was placed up at the register for me, and naturally I completely forgot about it while checking out & impulse-shopping the magazines by the register. A new magazine all about wedding flowers? Yes please. Alas, chalkboard painting fun will have to wait. #3- the materials need to create this little piece of decor I stumbled across here. 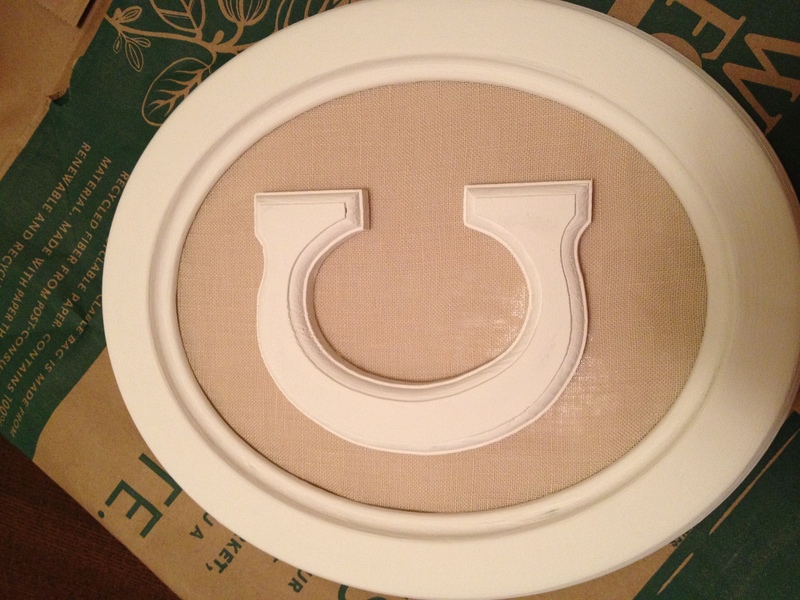 While I do anticipate bringing my own little rustic-framed-monogram to use for wedding decor, it will also be on display on my house (I’m not sure where, yet, between now and then. Somehow I managed to spend close to $100 at Michael’s… but I sure enjoyed a weekend of fun crafting! My framed monogram was very easy to make. I painted the frame and the wooden letter with white paint, and then attached the fabric around the glass insert from the frame. (I used a hot glue gun). 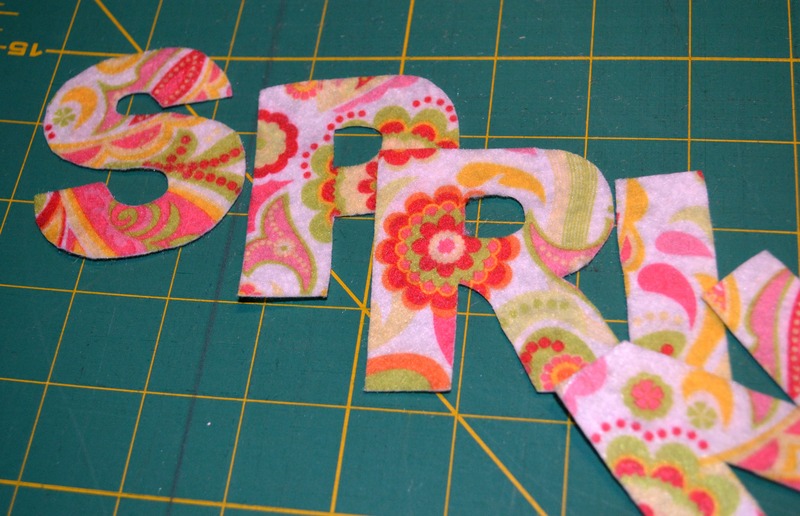 Once everything dried, I put it all together (gluing the letter right into the center of the fabric-covered-glass). I propped it up in a little plate stand- but I’m not sure where this will go yet. Possibly on our door? The original is ‘weathered’ a bit, which I may decide to do to this later. 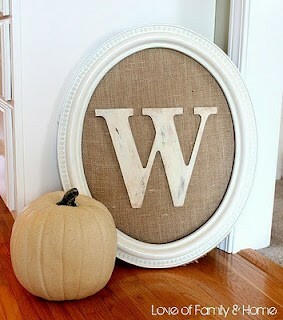 For now, though, I am enjoying the simplicity of the white & burlap colors. P.S. This is not my current last initial, but my future last initial! Should I have waited to celebrate my new name through crafting? I think not! Post Update: I’m sharing this little project over at Young House Love today as part of the Pinterest Challenge: Winter Edition! 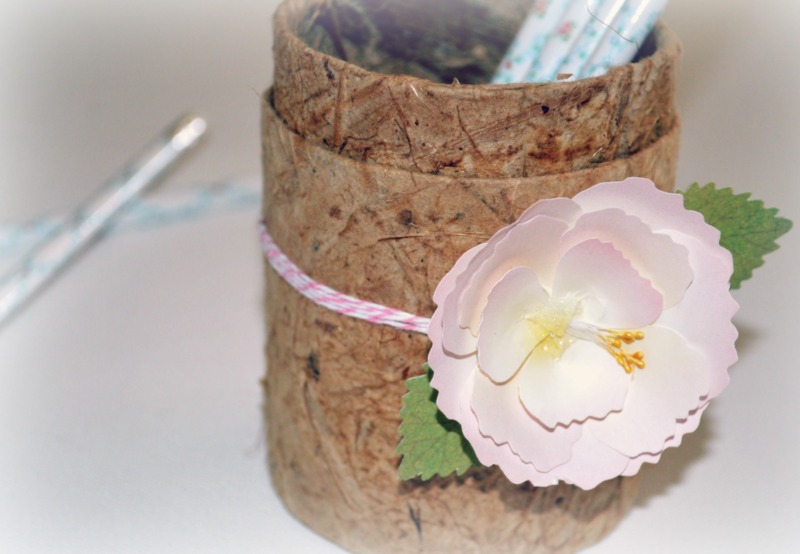 I am SO inspired by the amazing DIY projects taking place all over the blogisphere! Check out Katie, Cassie, Erin & Sherry’s challenge submissions!